“The Great One” is the leading point-scorer in NHL history, with more assists than any other player has points, and is the only NHL player to total over 200 points in one season – a feat he accomplished four times. In addition, he tallied over 100 points in 16 professional seasons, 14 of them consecutive. After his retirement in 1999, he was immediately inducted into the Hockey Hall of Fame, making him the most recent player to have the waiting period waived. The NHL retired his jersey number 99 league-wide, making him the only player to receive this honor. 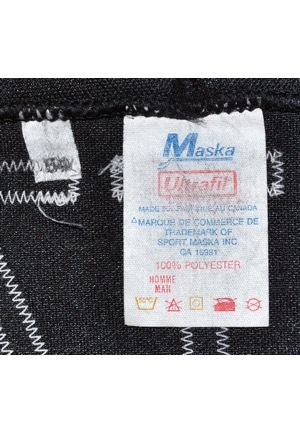 On the inner rear collar is the “Maska” manufacturer’s tag with “100% POLYESTER”. Adjacent to the left is an indecipherable tag. 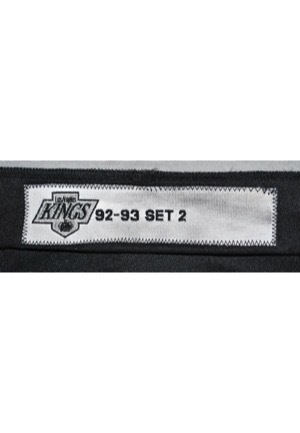 Centered on the inner rear tail is a white “Los Angeles KINGS” inventory strip tag reading “92-93 SET 2” embroidered in black. 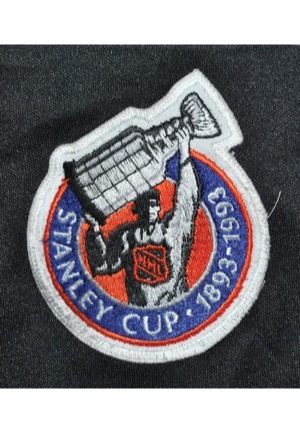 On the right chest is the “NHL STANLEY CUP 1893-1993” patch embroidered in orange, blue, silver, black and white on white tackle twill. 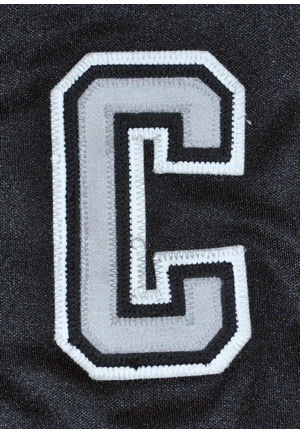 On the left chest is the Captain “C” in silver on black on white tackle twill. 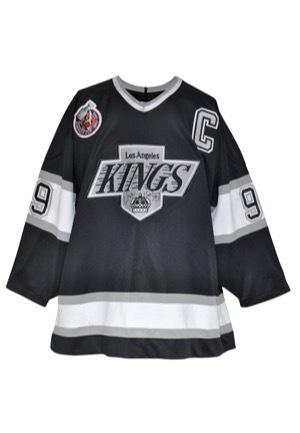 Across the front is the “Los Angeles KINGS” logo embroidered in black and white on silver on black tackle twill. 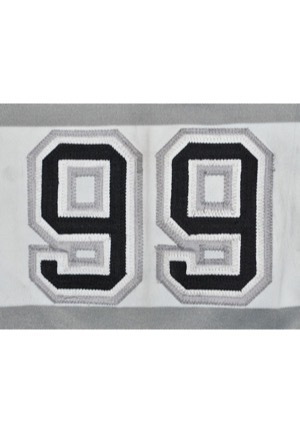 On each sleeve is Gretzky’s retired number “99” in black on white on silver tackle twill. 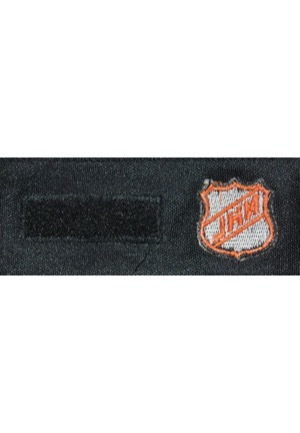 The left and right rear tail both feature the official “NHL” logo embroidered in orange and black along with “CCM” embroidered in black and white. Across the back is the player name “GRETZKY” in white tackle twill. 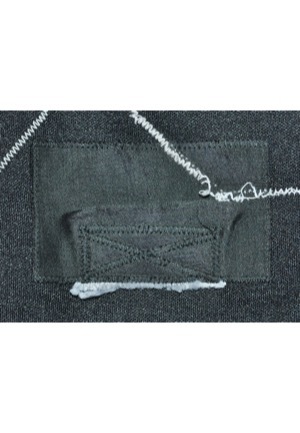 Adjacent below is the player number “99” in silver on black on white tackle twill. The fight strap has been cut off. 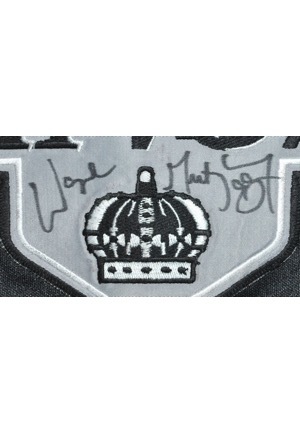 Gretzky has signed the “KINGS” logo on front of the jersey in black marker, in our opinion the signature rates a strong 8. 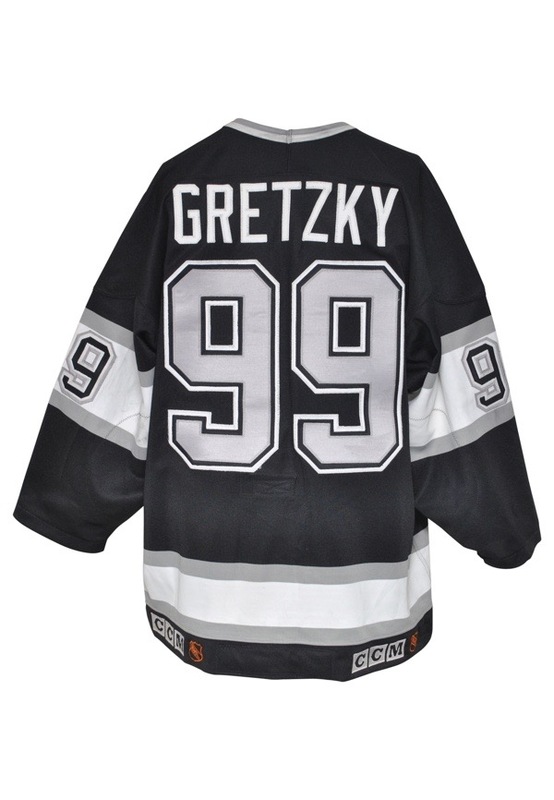 The jersey is properly tagged, was presented to us as game-used and in our opinion shows appropriately use considering the fact of the number of jerseys Gretzky was known to wear. 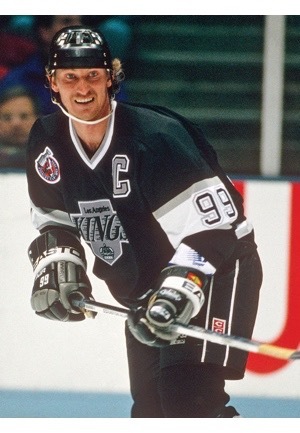 The team went through a logo update during this season and it is documented Gretzky wore this style, although an exact photomatch has yet to be discovered. This shirt matches a known hobby exemplar (Kelly Hrudey) of a common player down to a tee. 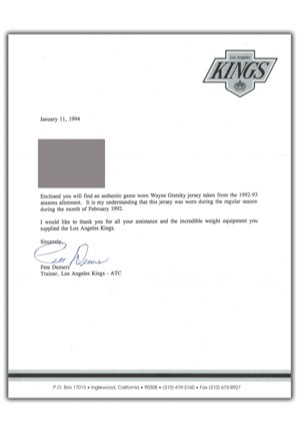 Accompanied by a LOA from JSA and an additional LOA from the Kings Corporate Account Manager, Todd Waks, stating that he received the jersey directly from Gretzky. Further accompanied by a LOA from the Kings Trainer, Pete Demers, stating that this is an authentic game worn jersey from the 1992-93 season.